Children are valuable gifts from God to mankind which no amount of money can buy. When God gives us children, he expect us to play our role well by providing provision, protection, discipline etc. if these children are to become better future leaders or citizens. But unfortunately, Liberia was became a dancing and breeding ground for poverty and the devil over the years with war all over in Liberia and neighboring Sierra Leone, Ivory coast and parts of Guinea. The fourteen year civil war in Liberia forced thousands of Liberians into refuge in search of security and better life. In the process of escaping to neighboring countries “from Liberia” many children lost their parents to stray bullets, hunger and other diseases thus leaving them with limited options to struggle in meeting the expense of their survival and security whilst in refuge. Some successfully escaped to Senegal but were abandoned in the streets of major cities in Senegal begging for their daily bread as if they were from nowhere. Having felt the need as Christians, a group of three Evangelist came together to establish the Children Souls Ministry in Senegal in 2000 with Evangelist Melvin Kpeh as the executive Director. The Children Souls Ministry is a non-for-profit Christian humanitarian organization which funding comes directly from friends, sympathizers, well wishers, sponsors and concepts organized by the children geared towards supporting themselves in refuge. According to Evangelist Kpeh, The Children Souls Ministry’s objective is to take as many children “out of the streets” as possible. 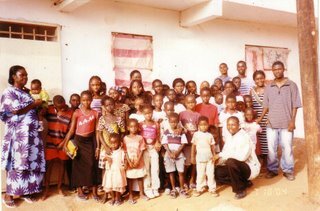 Evangelist Kpeh said his ministry has been involved in training, educating and sheltering homeless and abandon Liberian children in Senegal. He said his ministry does not want these homeless children to feel neglected by society but to see them feel part and parcel of society and to become better citizens who will return to Liberia to contribute to the reconstruction process. Evangelist Melvin Kpeh and his hard working staffs are working tirelessly to reunite these children with their parents “if they have” but unfortunately, most of the children are abandoned and don’t even know their parents and well about. The initial goal of the Children Souls Ministry was to cater to twenty children between the ages of five and fifteen years but because of the growing number of homeless children that are kicking at the Ministry’s doors, it has become almost impossible to say no to any of the children that hits the door with their personal belongings in plastic bags. In an online conversation with Evangelist Melvin Kpeh and Evangelist Titus Sebo, few touching and heart breaking questions was posted to this author. Evangelist Kpeh asked: Have you ever held a dying baby in your arms? Have you ever seen a mother in tears because she cannot look after her child or children? Have you ever watched as children beg for the very things that we throw out? Have you ever realized that you could or someone could be you? Have you ever care enough to make a difference in someone’s life? Both Evangelists Melvin Kpeh and Titus Sebo re-emphasized that their Ministry “The Children Souls Ministry” came into existence for the sole purpose of saving the lives of refugees and abandoned children that are left in the streets of Senegal to struggle in meeting the expense of their survival, security and education. He said some of these children are abandoned due the parents’ inability or unavailability to cater to them. Evg. Kpeh said as Christian he cannot only worship Jesus and continued to see homeless and helpless children died in the streets simply because there’s no one to cater to them. He said the vision of his Ministry is to see these children stand up and say we are not the church of tomorrow but the church of today. The Ministry also wants to see these children stand for the Biblical truths where other generations have failed. According to the executive director, since the establishment of the Ministry in 2000, they have moved from one building to another due to the Ministry’s inability to meet up with rent, utility bills and capacity to accommodate the heavy influx of homeless children. Due to the above reasons, the executive Director of the Children Souls Ministry “Evangelist Melvin Kpeh” is urging all Bible believing Christians to come to the aid of these homeless and abandon children.